How to pick unique colors of histogram bars in matplotlib? I am trying to plot a several histogram on the same plot but I figured out that some colors are assigned to different series, which bother me a little. Is there a way of forcing color bars to be unique ? 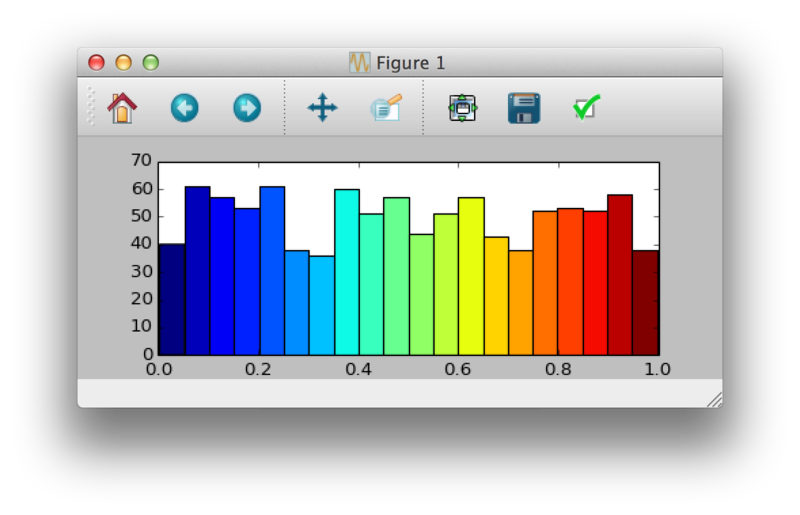 All the examples and the solutions to attribute colors to histograms in matplotlib (at least those I found) are suggesting to normalize x axis between 0 and 1 like this example , but this is not what I want to have because it is very important to have the real values in my case. [ 0.19215687  0.21176471  0.58431375  1.        ]]" I hope that's what you are looking for. Not the answer you're looking for? Browse other questions tagged python matplotlib histogram or ask your own question. How do I assign different dots different colors in a scatter plot made with MatPlotLib? Matplotlib: How to convert a histogram to a discrete probability mass function? How to generate random colors in matplotlib?